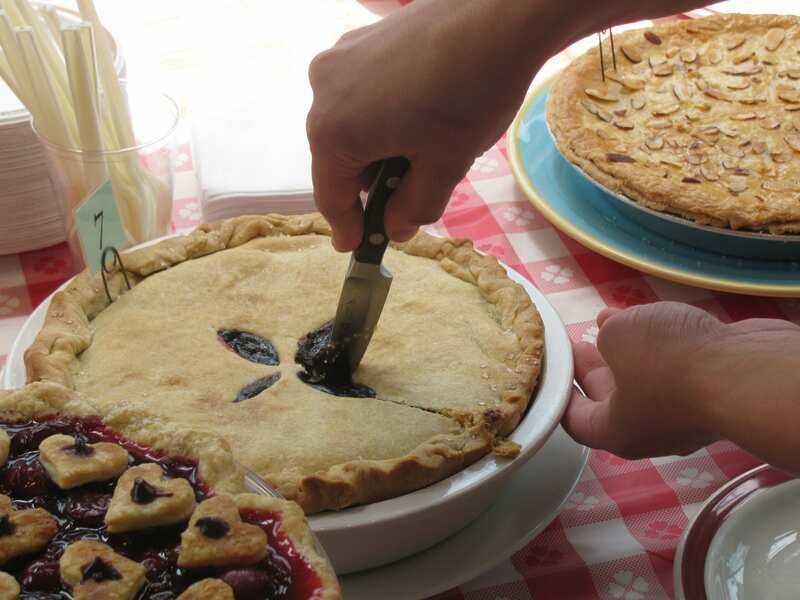 The competition was stiff and the crusts were flaky Sunday afternoon as 13 competitors gathered at High 5 Pie for the 2nd Annual Cherry Pie Bake-Off. Contestants ranged from professional bakers including Macrina Bakery pastry chef Mi Kim to contest veterans like 2011 Evergreen State Fair apple pie contest champion Ron Bryan to first time pie makers. The prize for 1st place went to Pie Number 8, baked by Emily McComb. The pie was strong and complex in flavor, judges note, with citrus in the crust and a cobbler-style almond-coconut crumble as a top. We’d eat that. McComb said her experience growing up in a family that farmed peaches inspired her cobbler topping. “My sister said you can’t make a cherry pie without almond, and this was a good way to get almond in there,” she said. McComb said she was inspired by the work of self-described “pie evangelist” Beth Howard, whose teachings can be boiled down in the title of her website: The world needs more pie. “You bake for people to show them love and kindness,” McComb said. Entrants were judged on a scale of 1 to 5 in the categories of appearance, crust, and filling. Each contestant presented the five judges with a slice before giving a brief speech about themselves and their pie. The room turned into a miniature pie-making convention while waiting for the judges to deliberate, as bakers swapped tips about filling consistency and crust theory. Finally, the judges finished tabulating the results and Cone announced the winners. 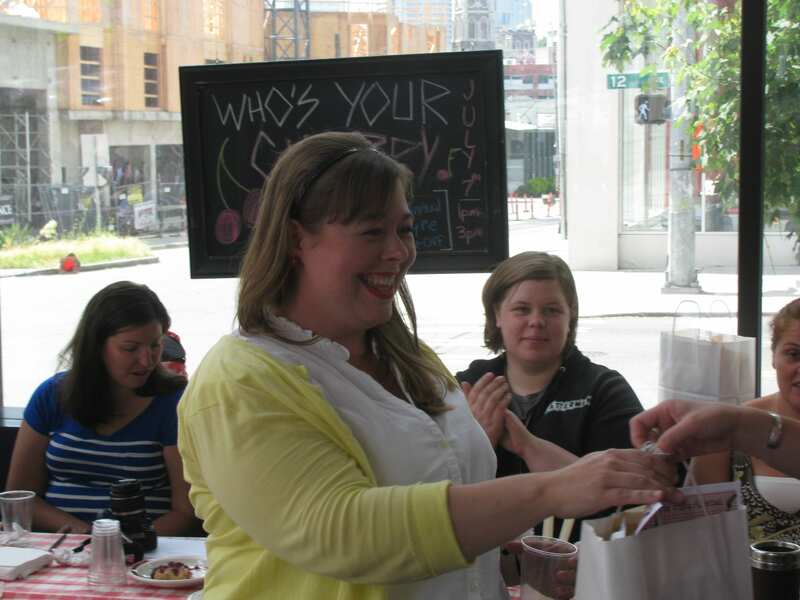 A special prize for Most Unique went to Kirsten Beck’s cherry-and-chocolate pie, a ganache-like concoction with fairly underplayed cherry tones, samplers said. “Pie is one of those things that brings everyone together,” said High 5 owner Dani Cone. Cone said CHS advertiser High 5 chose to base the competition around cherry for its classic looks and versatile flavor. “You can really get creative with that beautiful dark red,” she said. This entry was posted in Food & Drink, News, etc. and tagged sports by Sam Heft-Luthy. Bookmark the permalink. I've lived on Capitol Hill since age 0.5. Now I'm channeling that Hill experience into my work as 2013 CHS Summer Intern, where I'll be reporting on community happenings, art, music, and just about everything going on around the neighborhood. That Pie Champion is my neighbor and I can attest that she makes the most AMAZING Pies! Congrats Emily! You never cease to amaze us. Congrats on 1st Place – that honor does not surprise us because we know you are the Best! We Love You, Sheryl & Chuck.